Have you ever experienced the magnificence of the Grand Canyon first-hand? If so, the natural beauty and splendor of this journey is likely to live on in your memories forever. That’s why close to five million people from all over the world today are drawn to this destination. While some are content with viewing from above, others want to venture down into the heart of the canyon and mule rides can be an effective form of transportation. In fact, riding a mule is such a popular way to journey to the bottom of the canyon that you often have to book your space a year or more in advance. If you haven’t yet tried this method of transportation, you might want to consider it for a future excursion. If you want to plan a trip the Grand Canyon, you should know that this National Park is actually separated by a river that splits it into two distinct sections, and each side features very different characteristics. On one side lies the North Rim Village, which is the more secluded area with fewer accommodations and is known for its harsh winter conditions. In fact, during the snowy winter months the highway leading to this area is closed due to impassable roads. The South Rim Village, on the other hand, is much easier to access year round, making it preferable for most visitors. Keep in mind that about a 200 mile drive separates these two sides, taking about five hours to span this distance by car. The Grand Canyon itself is more than a mile deep, which can make for a strenuous hike for people who want to travel down the windy paths. Experts recommend that only those in prime physical condition take on the challenge of walking the canyon. For the rest of the world, traveling by mules is preferable. These mules travel in packs that are led by tour guides, and you can rest assured that the animals are well equipped to handle the difficult paths leading through the mountainside. But if you are under the impression that riding a mule sounds like an easy and relaxing way to travel, it’s important to note that it’s not near as easy as you might think. You will likely be sore at the end of the journey from trying to stay on the animal’s back as you move along the uneven paths. 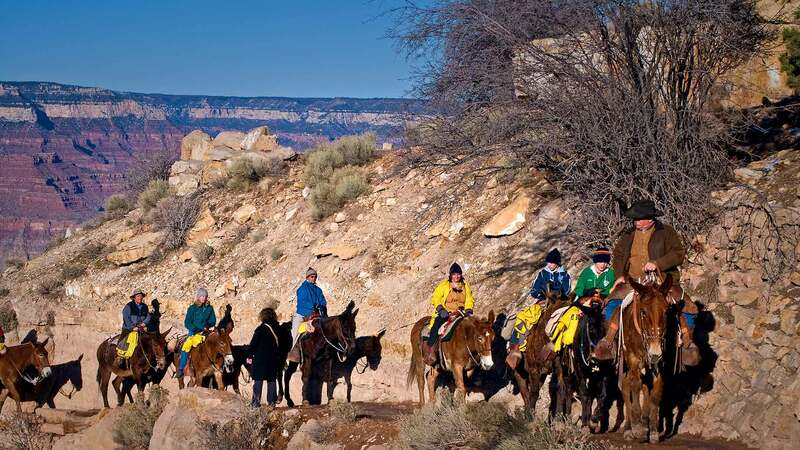 On the South side of the Grand Canyon, all of the mule rides are run by one tour operator, although you can book them through a variety of avenues. There are three basic types of mule tours available on this side from which you can select, depending on your timeframe and your endurance. The first option is a day journey that provides riders with a dramatic, panoramic view of the Canyon and the Colorado River that lies 1,300 feet below. The total length of this trip is about seven or eight hours. Those hearty souls that prefer to go all the way down to the floor of the Canyon can choose the second option, which is an overnight trip down to the bottom area. Sleeping accommodations are provided there at a place called Phantom Ranch, a lodging area consisting of rustic cabins that are reminiscent of an old western movie. Most of these rides follow the Bright Angel Trail, with the 2 day trip coming back up the South Kaibab Trail. Participants can also opt for a longer journey, including a two-night stay at the ranch. All of these tours include some meals. Also keep in mind that in addition to the price of the mule ride, you will also need to factor in the cost of getting to Grand Canyon from where you live, and any other travel-related expenses. If you prefer to take a less traveled path, you might consider touring the North side of the Grand Canyon. The mule rides for this portion of the national park are offered through several tour companies, so what you can expect to pay varies a bit. There are some qualifications that all participants must meet in order to sign up for a mule tour. First, riders must not weigh more than 200 pounds, must be at least 4 feet, 7 inches tall, and must not be pregnant. In addition, riding a mule requires both upper and lower body strength and good overall muscular fitness, so riders should be in good physical condition, not afraid of heights or large animals, and lastly, be able to speak and understand English. Riders are also required to sign an agreement acknowledging that they understand the risks involved with participating in such a tour, since animals can be unpredictable. Finally, different trips have different minimum age requirements, so check on this when you book your reservations if any children will be accompanying you. If you want to learn more about these or other tour options and find out how to plan for your journey most effectively, you can visit the website of the National Park Service and read about the array of excursions and recommended guidelines.